France; Late 15th Century. 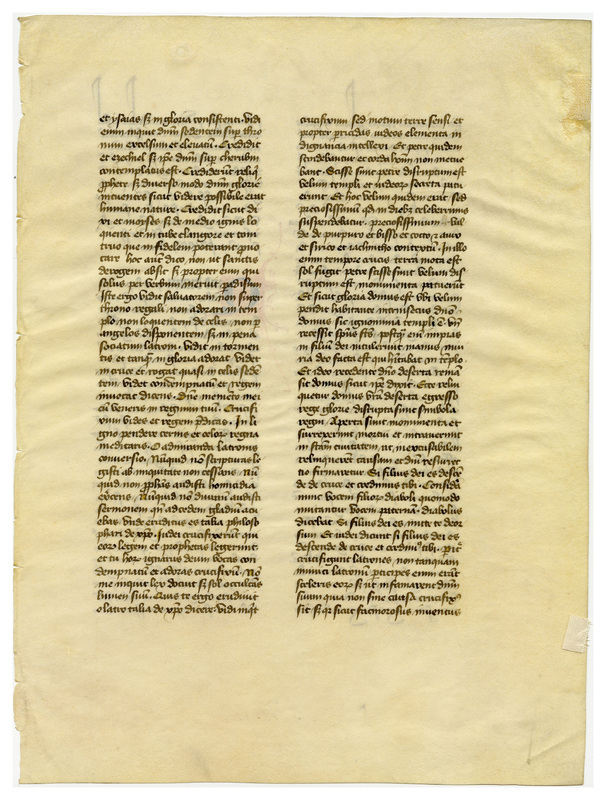 Latin Text; Lettre Bâtarde. This composite text includes the Dialogues of Pope Gregory I (St. Gregory the Great, 540-604 A.D.), which are largely autobiographical, and his writing on the lives and miracles of the early Italian Church Fathers. The book hand used is known as lettre bâtarde, a semi-cursive hand closely related to the everyday writing used by the people. Many French and Flemish printing types were based on similar bâtarde hands. The writing was done with comparative speed; the even tone and the exact alignment of the right hand margin, as well as the beauty of individual letters, are admirable. The long ascenders in the upper line were borrowed from the legal documents of the day. Many printers followed the practice shown here of emphasizing the tone of the first word or two in the beginning of a paragraph. It was usually done without varying the style of the letters, while here we see angular gothic used in the first third of the line, followed by the bâtarde script. These leaves are generally unadorned except for yellow filling in the first letters of sentences, and occasional use of rubrication for incipits or divisions; sometimes space has been left for rubrication which was not supplied. Three-line decorated red/blue initials are filled with very attractive and intricate swirls and beads. There are sharp tears to the inner margin where the leaf was separated from the binding thread. Some leaves contain text by St. John Chrysostom. Text: Not yet identified. The verso may contain text from Chrysostom's Homilía de cruce et latrone (before the decorated Q). 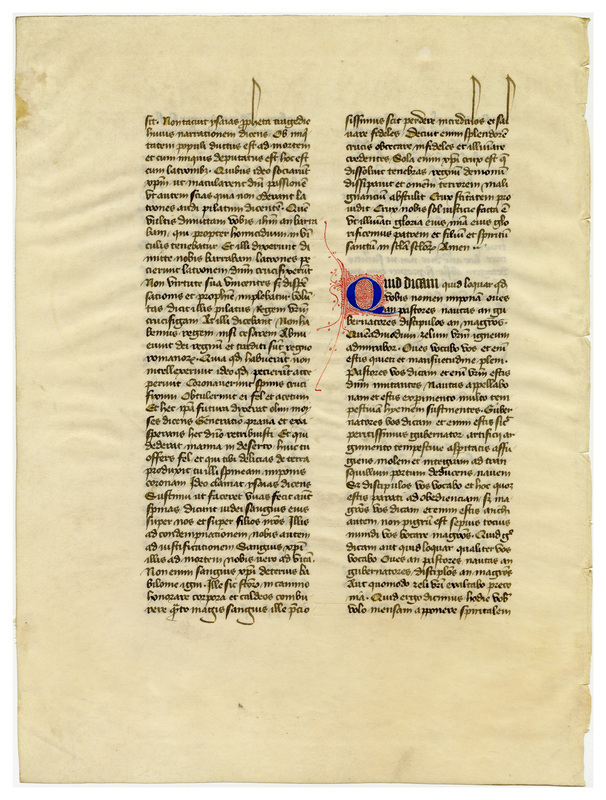 “E0041 Leaf from the Dialogues of Gregory the Great (S. Gregorius Magnus, Dialogi),” Digital Exhibits | Denison University Archives & Special Collections, accessed April 23, 2019, http://exhibits.denisonarchives.org/items/show/61.